Sound anything like your creative process? Probably you tried to deal with hassles much like the team responsible for this quote did: “After searching for a solution (and failing), we hacked together our own inefficient process of 5-10 different software tools.” And kept losing time and money. Fortunately for your marketing and creative teams, the team quoted above built their own solution. 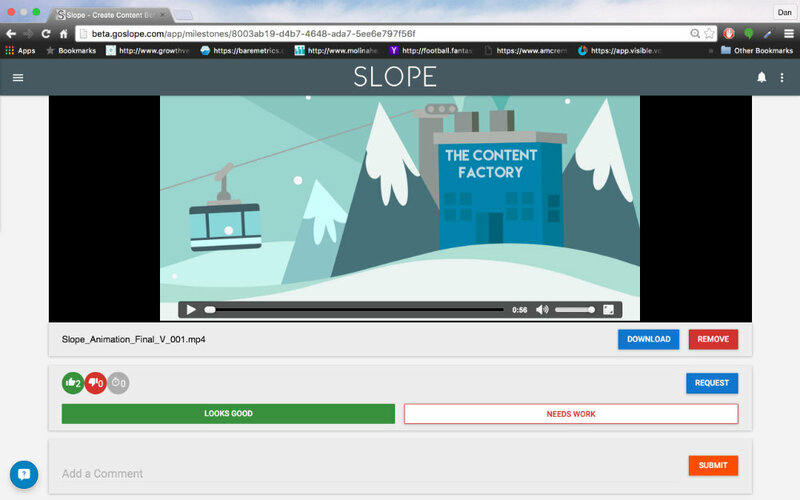 Slope is an end-to-end platform for producing visual content. It gives digital creatives, marketing directors, marketing and social media staff all one place to both collaborate and streamline workflow. Since Slope was created by a digital agency with firsthand knowledge of the pains of putting together visual content, it’s designed to make the entire process simpler and more efficient. Groups can plan and give one another feedback without resorting to other communication tools that are detached from materials. Slope serves as a place to store files, as well as different versions of projects, so everything is easy to find. Slope allows for both clients and teammates to participate on projects – anyone really, according to different levels of access or permission – which shortens feedback cycles and allows expedient approvals to keep projects moving forward. Tasks can be assigned and milestones measured, so that projects stay on deadline and everyone can clearly see what everyone else is doing. Finishing projects on time and under budget is, of course, healthy for business (not to mention, welcome relief for the stress that accompanies cumbersome workflow). The data and greater accountability that result from using Slope allow teams to refine their content production process even more – to figure what works and what doesn’t, and to adjust accordingly. So, teams can plan, communicate, collaborate, manage content, complete and review projects using only Slope. Instead of a disjointed process and confusing mess for all involved, Slope lets each participant do their job more effectively. Everyone wins. If you’re eager for a more satisfying experience orchestrating marketing campaigns or producing visual content, request early beta access to Slope at goslope.com.